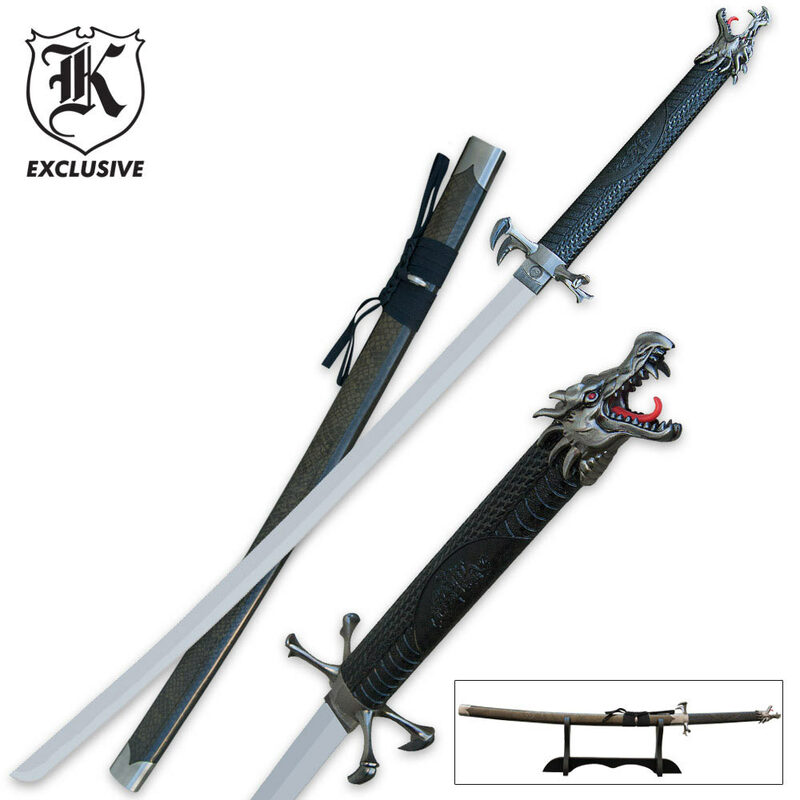 Screaming Dragon Samurai Sword with Stand | BUDK.com - Knives & Swords At The Lowest Prices! The Screaming Dragon sword hales from the darkest caves of feudal Japan. It has arose in the 21st century as the ultimate Samurai warrior's sword. The roaring dragon's head pommel is like nothing you've ever seen on a sword before! It is a must have for serious sword collectors. Got here quick. Love the blade it has to be my favorite in my collection. Just a great piece. Recommending sword and site to all my weapons collectors I know. Very well designed. The talons are sharp, so be careful with them. She was everything I hoped she would be. Beautiful piece, well worth the price, beautiful quality work on the every piece. Nice weight balance, came sharp. Cool dragon head. Great sword for the price. Built well and will be a fine addition to your collection. It is beautiful and draconic in every way. I love it so. I am extremely satisfied with the product the overall beauty of this katana is so breath taking it trully is a masterfully crafted sword and words cannot descibe how fulfilled I am and at such a great price at first I thought it woe fell cheap but the attention to fetal and the overall theme of this blade makes people think that it was very expensive this is my first katana and my favorite I hope other people can experience this katanas beauty this definitely was a good by and I will be returning to truswords.com very soon! It looks amazing on the picture. However half of the whole thing is made from plastic. If you look at it close enough you can see how cheesy it looks. When you hold it you feel as if the blade is about to snap off the plastic hilt. The guard, and pommel are made from hard plastic. The hilt is made from soft crappy plastic that you can break if you squeeze hard enough. The blade is nice but this does not cover up how fake it feels and looks up close.